Who'd a thunk it? Monday Night Football turns 35 tonight. We celebrate with our selection of the 10 best games in the show's long history. With O.J. Simpson sidelined in the second half due to an ankle sprain, the Bills turned to their passing game in this season opener. 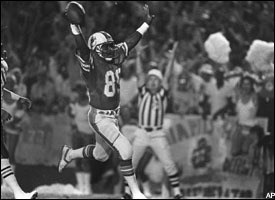 With 1:56 left, Joe Ferguson connected with Ahmad Rashad on fourth down; the nine-yard TD pass put the Bills ahead 14-13. Buffalo stopped Oakland on the next possession and looked to run out the clock, but Raiders DT Art Thomas scooped up a Jim Braxton fumble and ran it back 29 yards for a TD that put the Raiders back ahead, 20-14, with 1:14 remaining. On Buffalo's final possession, Ferguson drove the Bills 72 yards in eight plays, finding Rashad again for what proved to be the game-winning TD with 26 seconds left. George Blanda, still going strong at 46, got a chance to give the Raiders a win with six seconds left, but missed a 50-yard field goal. Final score: Bills 21, Raiders 20. This one featured two great performances and a close finish. Oilers running back Earl Campbell, on his way to collecting both Rookie of the Year and MVP honors, ran 28 times for 199 yards, racking up 81 of them on a spectacular TD run with one minute left in the fourth quarter to put Houston up 35-23 and seal the victory. It was his fourth TD of the night. Dolphins QB Bob Griese was 23 for 33 for 340 yards and two TDs. The Oilers, contending for a wild card spot at the time, improved to 8-4, while the Dolphins fell to 9-3. The teams would meet again in the first round of the playoffs, with the Oilers winning again. Final score: Oilers 35, Dolphins 30. A classic rematch: Seven months earlier at RFK Stadium, the Redskins had defeated the Cowboys to win the NFC championship. Washington, behind the running of John Riggins and the passing of Joe Theismann (28 of 38 for 325 yards and two TDs), piled up a 23-3 halftime lead. They looked invincible. But in the second half, the Skins fell apart and the Boys got hot. Dallas QB Danny White, who was a pathetic 1 of 9 for 10 yards in the first half, had a great second half, throwing for 183 yards and 3 TDs (including 75- and 51-yarders to Tony Hill) and running for another to lead a spectacular comeback that put the Cowboys ahead for good, 31-23, with two minutes remaining. Theismann threw a meaningless TD pass with a minute left -- the game, by then, was over. The Redskins went on to win 14 of their final 15 regular-season games, including the rematch against the Cowboys in Dallas on Dec. 11. Final score: Cowboys 31, Redskins 30. The Jets dropped this pass, but rallied with 23 fourth-quarter points. In the fourth quarter Testaverde was18-of-26 for 235 yards. He finished 36 for 59 for 378 yards and 5 TDs. Marcus Coleman was the defensive star of the game, grabbing his third INT of the night to set up Hall's winning OT kick. Final score: Jets 40, Dolphins 37. The most total points in MNF history and a combined 1,025 offensive yards. Five lead changes in the final quarter. Jan Stenerud nailed what turned out to be the game-winning kick from 20 yards out with 54 seconds to play. Skins kicker Mark Moseley got a chance to be the hero, but missed from 39 yards out with 3 seconds left. Joe Theismann completed 27 of 39 for 398 yards and two touchdowns. Packers QB Lynn Dickey was even better, completing 22 of 30 for 387 yards and three touchdowns. Final score: Packers 48, Redskins 47. What a dramatic return for the Tuna. In a see-saw fourth quarter, the Giants came back from a 29-14 deficit with two TDs, a two-point conversion, and a 30-yard field goal by Matt Bryant with 11 seconds left for an apparent 32-29 win. Dallas kicker Billy Cundiff celebrates his big night (7 FGs). But the Boys got the ball on their own 40 when Bryant's ensuing kickoff went out of bounds. Quincy Carter connected with Antonio Bryant for 25 yards, setting up Billy Cundiff's sixth FG of the game, a 52-yarder. 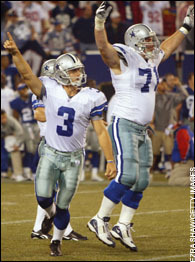 In overtime, Cundiff came through again, nailing a 25-yarder for a Dallas win. The kicker's seven field goals tied an NFL record. Bill Parcells, who'd coached the Giants to two Super Bowl wins, had won his first game as a Cowboys coach on what used to be his home turf. "It was one of the greatest games I've ever been involved in," he said. Final score: Cowboys 35, Giants 32. The Colts trailed 21-0 at the half and 28-7 after three quarters. Down 35-14, James Mungro scored on a 3-yard run with 3:37 left, Idrees Bashir recovered the onside kick, and 68 seconds later Peyton Manning hit Marvin Harrison for a 28-yard TD. With only 1:41 left and the ball on their own 15, the Colts drove 85 yards for the game-tying TD with 35 seconds remaining. Then Mike Vanderjagt kicked the game-winning field goal from 29 yards out with 3:47 left in OT. No NFL team had ever recovered to win when down by three or more TDs with less than four minutes remaining. Final score: Colts 38, Bucs 35. End of first quarter: 7-7. End of second quarter: 14-14. End of third quarter: 21-21. Finally, with 4:08 left, Lin Elliott broke the deadlock with a 19-yard chip shot. A bizarre trade of fumbles followed: Shannon Sharpe lost the ball on the Chiefs 40 and KC recovered, but on the very next play, Marcus Allen fumbled and the Broncos recovered. Then Elway ran in for a TD on another strange play, with the confused Denver offense fielding only 10 players. Score: Broncos 28, Chiefs 24. Montana followed with a picture-perfect two-minute drill from his own 25, completing seven of eight passes, including the final 5-yard TD pass to Willie Davis with 13 ticks to go. On the day, Montana was 34 for 54 for 393 yards and 3 TDs. Elway completed 18 of 29 for 263 yards. Final score: Chiefs 31, Broncos 28. Nat Moore and the Dolphins burned the Bears' defense. The conventional wisdom is that this was the greatest Monday Night Game ever, and the CW is right. First, you had history -- the Bears came into the game 12-0 and were aiming to match the 1972 Dolphins' undefeated season. Second, you had ego -- there was a month to go in the regular season, and the Bears were already planning their Super Bowl victory party. Third, you had Miami, led by Dan Marino and his Amazing Arm, at 8-4 and in a battle for the AFC East title. The Dolphins were virtually unstoppable in the first half, taking a 31-10 lead into the locker room. Already the Bears were doomed -- this was the first (and only) time they'd given up more than 30 points in 1985. The Fins went on to win 38-24, handing the Bears their only loss. Marino was 14 of 27 for 270 yards and 3 TDs. Miami had been ready to take down Chicago. Carl Hiaasen of the Miami Herald wrote of super-celeb of the moment William Perry, "This is what the Refrigerator did to become famous: He took a football, ran 3 feet and fell down. It doesn't sound like much, but when you're 307 pounds, this is all the excitement you can stand." Ouch. Final score: Dolphins 38, Bears 24. Considering that Monday Night Football has been a huge part of American pop culture and TV history over the past 35 years, there's surprisingly little documentation about the games. The best MNF history I could locate was from the wonderful Wikipedia folks. Go there then check out ABC's rundown of its top five MNF games. These selections date back a couple of years; it's hard to argue with any of the choices, but a few video clips sure would help in jogging the memories. Sal Maiorana recaps the highlights of the great Jets-Dolphins rivalry, including the 2000 "Monday Night Miracle." For box scores over the past 10 years, Football @ JT-SW.com is the place to go. The Line Score Project hasn't reached the MNF era yet, but it's got every game from 1920 to 1969 and is moving fast. The NFL History Network also has a few folks working on the greatest games of every franchise; the page on the Jets' classics is the best-developed. Official team sites are hit-and-miss for historical info, most focusing on chronology and almanacish facts. The Chargers have a fairly typical history section.